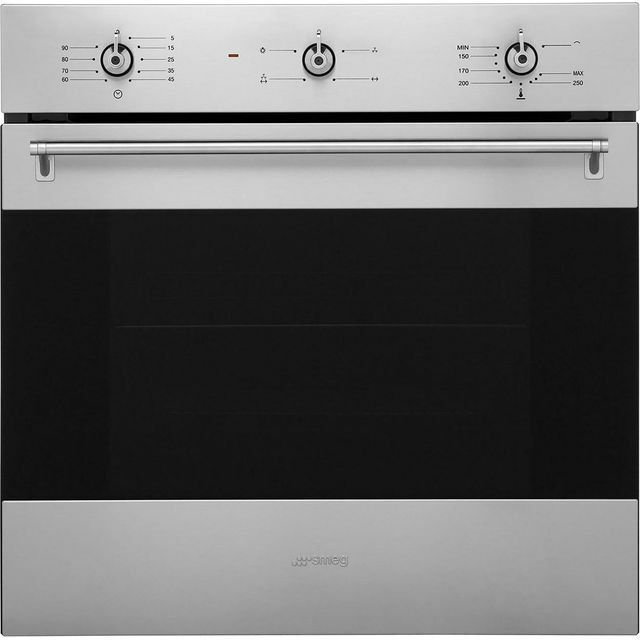 Prepare every meal to perfection with this superb stainless steel Smeg built-in electric single oven. Because it’s multifunctional, you’ll have lots of ways to get creative, whether you’re batch-baking with the fan setting or using the grill option to put the finishing touches to a speciality dish. Thanks to its generous 72 litre capacity, it’s deal for large households or if you like to entertain. There’s also a handy electronic minute minder that lets you know when your food’s ready. And, when it’s time to clean up, this model has a grease-proof enamel interior that just needs a simple wipe to keep it spotless. This appliance is designed to fit at eye level or under a worktop. The stainless steel finish of this oven will not only add a sleek and modern edge to your kitchen – it’ll cut down on cleaning time too. Coated with a clever fingerprint resistant protective layer, smudges and prints disappear on contact with the shiny silver surface of this appliance. This means that you won’t need to constantly wipe it to keep it looking spotless and new! 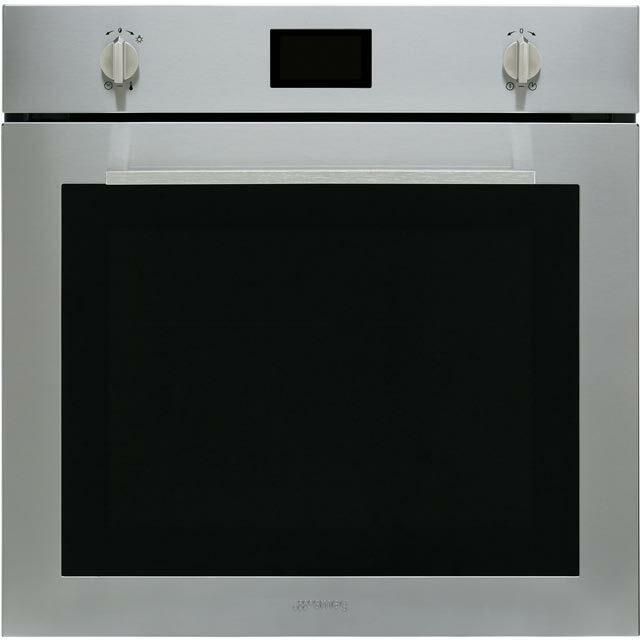 This Smeg oven has a special Circulaire fan function which distributes air from the circular heating element evenly throThis Smeg multi-functional oven has a clever SmartSense programme which makes it easier than ever to cook your favourite recipes. Select from a range of different food types - including meat, fish, vegetables and cake – and the oven will calculate the best cooking time, temperature, shelf and function to make sure your food is cooked to perfection every time. 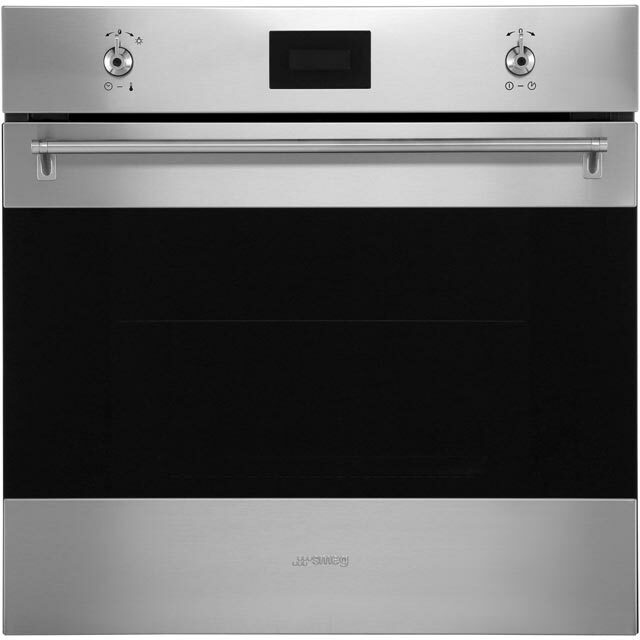 ughout the oven for consistent cooking on every shelf without any flavour transfer between sweet and savoury foods. Food cooks more quickly too, and there’s no need to preheat the oven, making it extra economical – so you’ll keep your electricity bills low. 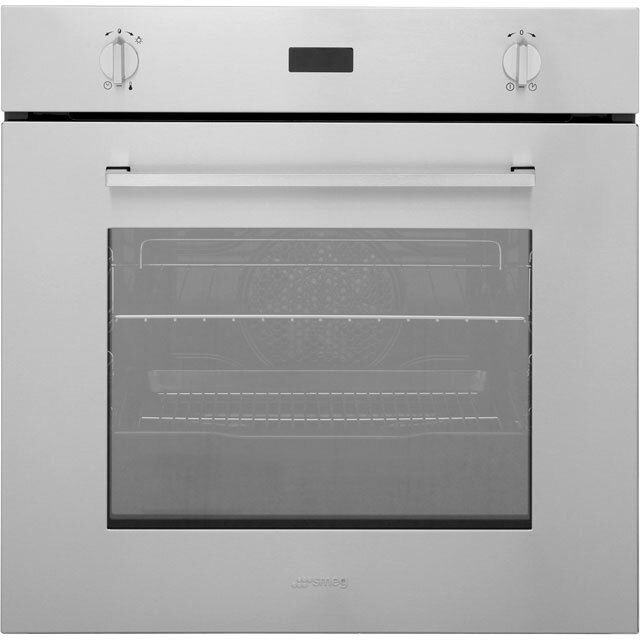 You can cook a huge Sunday dinner for everyone with ease in this large oven. The generous capacity means it’s perfectly suited to a large household – there’s more than enough room for you to roast a big joint of meat at the same time as cooking a few trays of vegetables. So it’ll be easier than ever to coordinate mealtimes, as you can cook your main and side dishes all at once, ensuring everything is perfectly cooked and piping hot, exactly when you’re ready to serve. Smeg have taken the hassle out of cleaning the oven with the Vapour Clean feature on this model. All you need to do is pour around 40ml of water into the bottom of the oven and select the Vapour Clean function from the control panel. The oven will use the water to create steam inside the cavity, loosening any baked on food and grease, so that it will wipe away easily when the cleaning cycle has ended. Beautiful oven. Takes a bit of getting used to as the manual is difficult. Lots of twisting and knob pressing, quite complex but once figured out, cooks fab. Lovely sleek stainless steel front. Simple to use. Extra large interior. New feature of oven includes a pizza baking shelf which is great. Bright interior light. Rapid cooking. 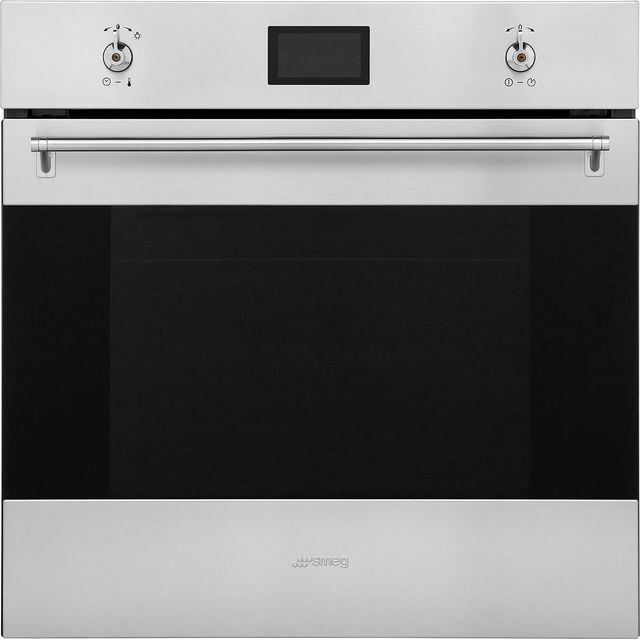 The perfect discreet oven, affordable class. Would recommend. Good looking oven that's simple to use and works! I was a little cautious about Smeg as I considered the brand more style over substance, but I was proved wrong with this oven. It is excellent. Heats up quick, is easy to use, produces excellent results, has a large capacity and has more than enough functionality. As an added bonus it looks good and plugs into a 13amp socket. This replaced an old Ikea oven and I can't be happier. After a couple of weeks of use I can fault it. I love the ease of temperature control and it cooks so much better than my old oven, giving succulent roast meat and evenly cooked cakes.